Steve Chasteen, AIFireE, C.F.I., C.F.E.I., has been in the fire service since 1972 serving as a volunteer firefighter and a full time career firefighter and company officer for 27 years for the City of Bloomington, Illinois Fire Department. He worked as a municipal fire investigator for the fire department for a number of years prior to returning to suppression duties on a ladder company where he retired as a Lieutenant. Steve has also worked as a private fire investigator working in the insurance industry conducting fire investigations for the past 32 years. He has conducted more than 2,800 fire scene examinations and fire analysis to determine the origin and cause of the fire. Steve has testified extensively in both State and Federal Court as an expert witness. Steve is recognized as an “Associate at the Institute of Fire Engineers in London, England. He is a “Certified Fire Investigator” recognized by the International Association of Arson Investigators as well as a “Certified Fire and Explosion Investigator” recognized by the National Association of Fire Investigators. Steve also attended the ATF National Academy in Glynco, Ga. He is still a member of the MABAS 41 Fire Investigation Team in McLean County, Illinois. Steve also works as a “Field Staff Instructor” with the University of Illinois Fire Service Institute in Champaign, Illinois. He has worked as one of the lead instructors in the Fire/Arson Investigation Training Program providing instruction to firefighters, police officers and insurance company representatives. 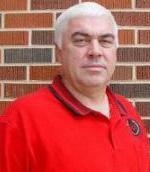 He is also a National Instructor with the Public Agency Training Council in Indianapolis, Indiana. Steve has also provided fire investigation training to criminal investigators from various branches of the US Military. Steve regularly consults with various local and state fire officials as well as law enforcement agencies around the country to provide assistance in fire investigation and fire scene analysis. He has also provided expert assistance to prosecutors in criminal cases as well as to the insurance industry and manufacturers in civil cases. In today’s Court challenges we are seeing opposing sides attempt to exclude “Experts” and denied them the opportunity to give their expert opinions. We will cover the latest up-to-date techniques being used against investigators today. We will cover case laws that can affect investigators including Daubert, Kumho, and Joiner. The detailed study of how chemistry, fire science, and the engineering disciplines of fluid mechanics and heat transfer interact to influence fire behavior. The visible or measurable physical changes, or identifiable shapes, formed by a fire effect or group of fire effects. Courtroom evidence that is not grounded in methods and procedures of science is no more than subjective beliefs or unsupported speculation and is unreliable; thus is inadmissible under rules dealing with testimony by experts. Therefore; we will cover tactics, techniques, and procedures that the attendee can take back and put into immediate use in their respective jurisdiction. This course is presented using today’s literatures including N.F.P.A. 921 2008 Edition, Kirk’s 6th Edition and others. A Class CD will be provided with many resources for the investigator in this seminar. Class size limited to 50 attendees in most cases, with group Practical Exercises in Pattern Recognition, and Certification testing. 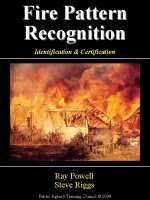 “The Certified Fire and Explosion Investigator (C.F.E.I.) Examination” National Association Of Fire Investigators C.F.E.I. Test Will Be Offered and Applications Accepted At This Class.